What is the Value Dynamic of Education? Learning is a natural part of human existence. Babies learn from the moment they are born, and the process continues throughout life. Education is a man-built construct that, at its best, enables more and better learning to take place, and at its worst blocks a persons natural inclination to learn. Good education helps a person make the most of their natural talent, and prepares a person to take advantage of opportunities that they will have in the future. Education should be a good fit for the individual, and a good fit for the society. Education that is the most fun may not be the most useful. Education that is the most costly may not be the most valuable. The very young learn have a lot to learn. In the first three or four years of life all sorts of things have to be learned. Eating and drinking, and the control of bodily functions … walking, talking … and being part of a social group, the family. At this stage education or learning and parenting are intertwined. And then it is the first schooling … Pre-K and Kindergarten in the USA and equivalent in many other places. At this stage a child is learning not only from the family setting but now from a broader group of adults and other children. During primary level schooling from age around 5 to around 13 a child becomes a young person and should have the opportunity to learn a lot about many things. At the core this schooling should enable students to master the 3 Rs … Reading, wRiting and aRithmetic which are the foundation for so much that is important for their future. In addition schooling should reinforce parenting in developing character and sense of value so that a person will be a contributing member of society. As a child moves into secondary education from age around 13 to around 18, education should have some focus on what a person might be doing in their adult life. Students should be learning what is going to be of value to them as they mover forward into their adult lives. For some the track will be towards further academic education and for others the track should be towards more 'hands on' technical training. In both cases the goal should be to be getting the best match for the student and the opportunities that are going to exist in their adult lives. Some students will benefit from academic tertiary education from age around 18 to around 23. Some students will benefit from technical education in this same age window. There is a cost associated with education at all the stages, and there is an important valuadd at each of the stages. In general, the management and control of costs and the optimization of valuadd are not subject to a rigorous regime of measurement, accounting, reporting, analysis and accountability. Education, like everything else, should evolve as needed to suit the society that exists, and the society that students will have to be part of during their adult lives. In thinking about measurement, there should be clarity about what is 'correlation' and what is 'cause and effect'. In the past, more education for a student has had a cost, but the earnings of a well educated adult have been substantially higher than for a person with little or no education, and the relationship between cost and benefit was favorable. At the present, education has a high cost and many more students have made the investment, but the opportunities for this investment to result in substantially higher earnings is significantly diminished. The argument or justification for investment in more education is based on past experience, and the understanding of what is optimum for today's students has changed. 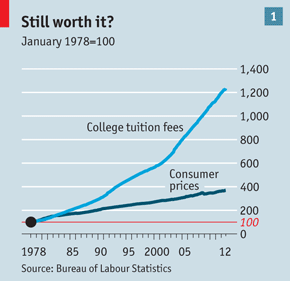 This graph from 1978 to around 2012 shows the dramatic increase in the cost of education over this time. At the same time, there are a lot of people who work in education that are being paid relatively low wages, evidence that the productivity of education has not improved very much. This may be yet another example of technology adding cost without doing much for productivity. We follow one boy's journey from a Palestinian refugee camp in Lebanon to the UK's most prestigious public school. Does a Harvard education pay off? TED Talks ... Sir Ken Robinson: Bring on the learning revolution! TPB comment: YES but there must also be opportunity to use the benefits of education in a meaningful way. Financing education without financing opportunity is wasted effort! Education can be a great success, but a minimum level of resources is needed. Very poor communities are in a poverty trap in part because of the education deficits. Is a priority sector, but has not been well integrated into a total development framework. The “north” model usually used is more costly than it needs to be, and government budgets cannot be enough. Not much focused on economic needs of students. Should be a priority, but using local resources to the maximum, and not assumed to be funded by government. Education is a precondition for productive employment, .